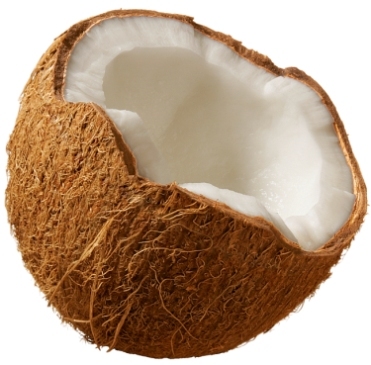 If you have a piece of fresh coconut in your refrigerator, try this recipe. It is quick, easy and delightful. The rice is cooked with whole sweet spices, and golden-fried coconut strips are folded in along with the chaunk (spices cooked in ghee or coconut oil), which adds to the flavor. Finally, the dish is garnished with more coconut strips. This is a most attractive rice dish, with a slightly crunchy texture and faintly sweet, toasty flavor. It can be served on any menu in any season. ½ teaspoon black mustard seeds. If basmati rice is used, clean, wash, soak and drain. Bring the water to a boil in a heavy 1½-quart/liter nonstick saucepan over high heat. Stir in the rice, salt, cinnamon stick and cloves. When the boiling resumes, reduce the heat to very low, cover with a tight-fitting lid and gently simmer without stirring for 20-25 minutes or until the rice is tender and fluffy and the water is absorbed. (You may wish to cook your rice in lots of water and drain it – your choice, says Kurma). Remove from the heat and let the rice sit, covered for 5 minutes to allow the fragile grains to firm up. In the meantime, heat the ghee or oil in a small frying pan over moderate heat. Stir-fry the coconut strips until golden brown. Remove with a slotted spoon. Toss in the cumin seeds and black mustard seeds and fry until the mustard seeds turn gray and sputter and pop. Pour this seasoning into the rice, add two-thirds of the fried coconut, gently mix and remove the whole cloves and cinnamon stick. Serve: spoon the rice onto a serving platter and garnish with the remaining fried coconut. *Note that since Yamuna wrote her recipes using US measurements, the weights are in US with metric in brackets. More importantly, her tablespoons are US (15ml) whereas Australian/metric tablespoons are 20ml. So if you follow these recipes using metric measures, your tablespoons should be scant. Similarly, the US cup is 240ml as distinct from the Australian/metric 250ml cup. The same scant measuring should thus apply to Australian/metric cup users. The teaspoon is a universal 5ml.